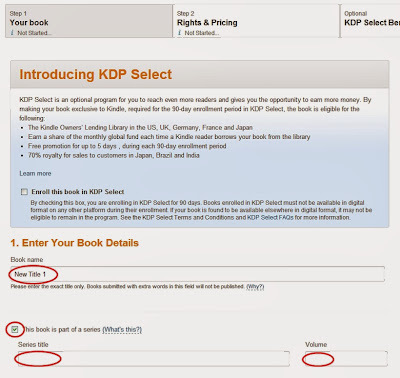 Amazon is one of the most widely known eBook supplies and therefore I highly recommend creating an Amazon account, if you don't already have one, and heading over to Kindle Direct Publishing. 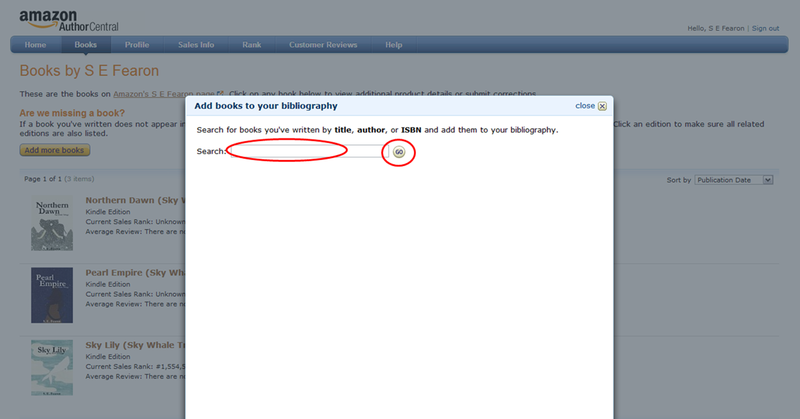 Once you have signed in you will find yourself in the bookshelf section of your account. 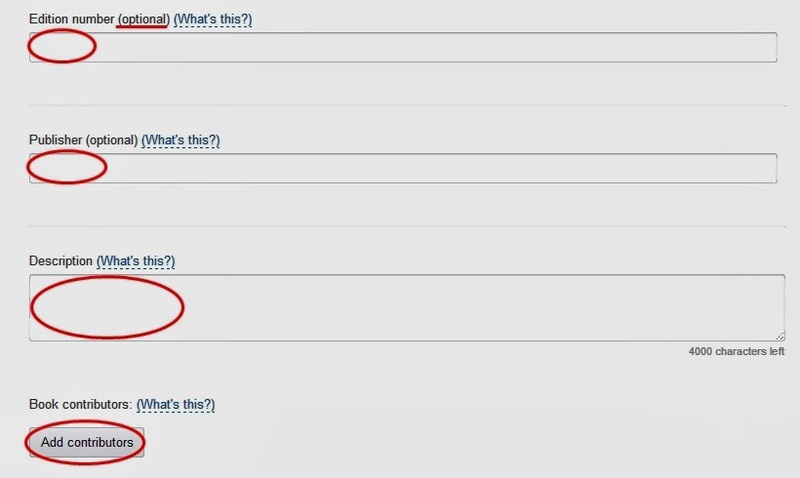 Here all you need to do to get started is click add new title. This will take you to a new page where you will be taken through a two step process. Step One: Your Book, first you want to enter your book name and select this book is part of a series, if applicable, then you need to enter the series title and the volume number. 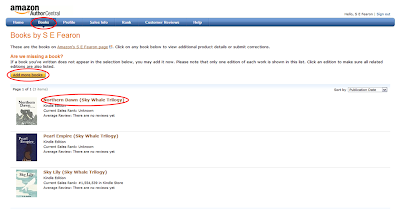 If you plan on producing several editions of your book you will need to enter an edition number, however this is optional. Next you should enter the name of your publisher. Then you want to enter your synopsis in the description box. Next you want to click on add contributors, this will open a popup and here you add the name of the author, the editor, the illustrator, and anyone else who has contributed to the book. It is important to ask the contributors how they wish their name to appear, a full first name and a surname or simply their initials and surname. 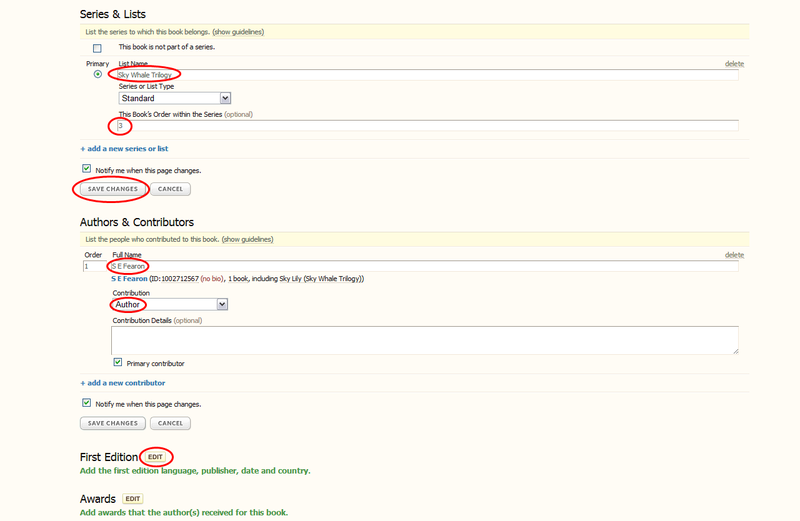 Then you want to select the major language of your book. 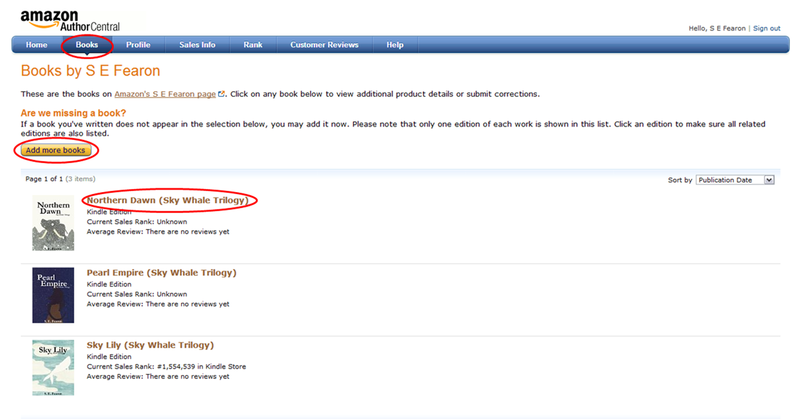 You need not enter a publication date. And if you have one enter your ISBN number. 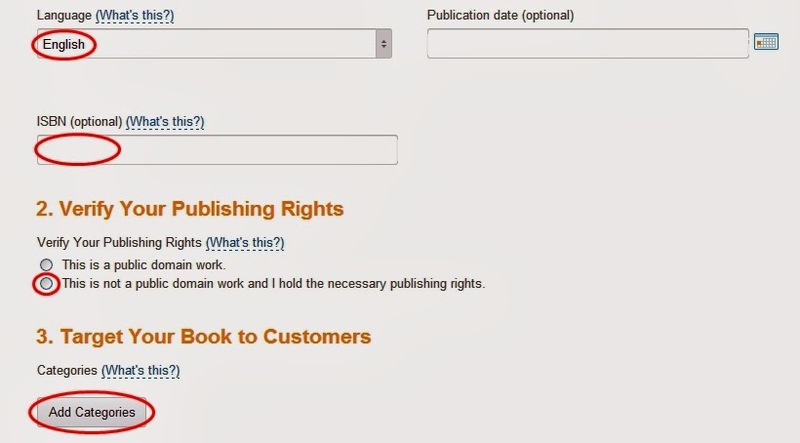 Then under verify your publishing rights you want to select this is not a public domain work and I hold the necessary publishing rights, unless of course it is a public domain work and in which case select this is a public domain work. 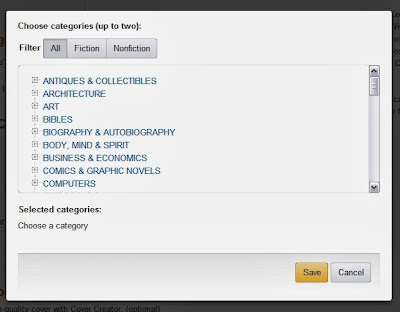 Next you want to select the categories you wish your book to appear under, so click add categories and select two from the popup. Once uploaded I recommend selecting enable digital rights management. DRM is intended to prevent the unauthorized distribution of your book. Note that your readers will still be able to lend your book to other readers for a limited time and they can still purchase your book as a gift for another reader. 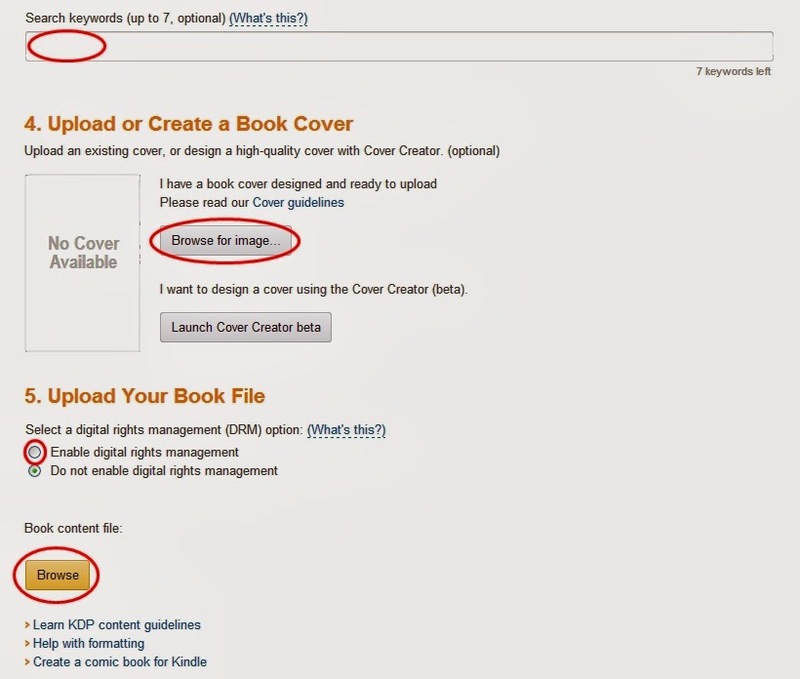 Before you save and continue you will be given the option to preview your book online. 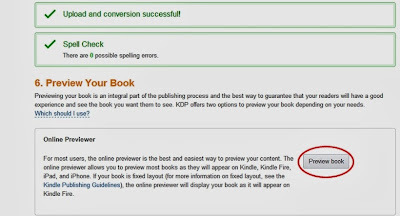 I recommend clicking on preview book and then when the new page is loaded flick through your book in its entirety to ensure that all the formatting is correct. Once done you can move on to the next step of the publishing process. 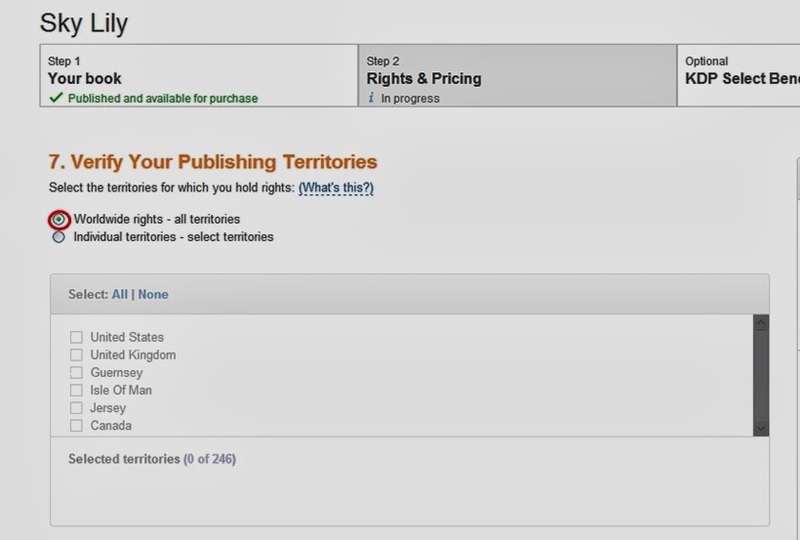 Step Two: Rights & Pricing, first of all it asks you if you hold worldwide rights or individual territories rights to your book. Unless your book has been previously published through another publisher you should select worldwide rights, however if your book has been published before through a different publisher you will need to find out from them where their publishing rights apply so that there are no conflictions. 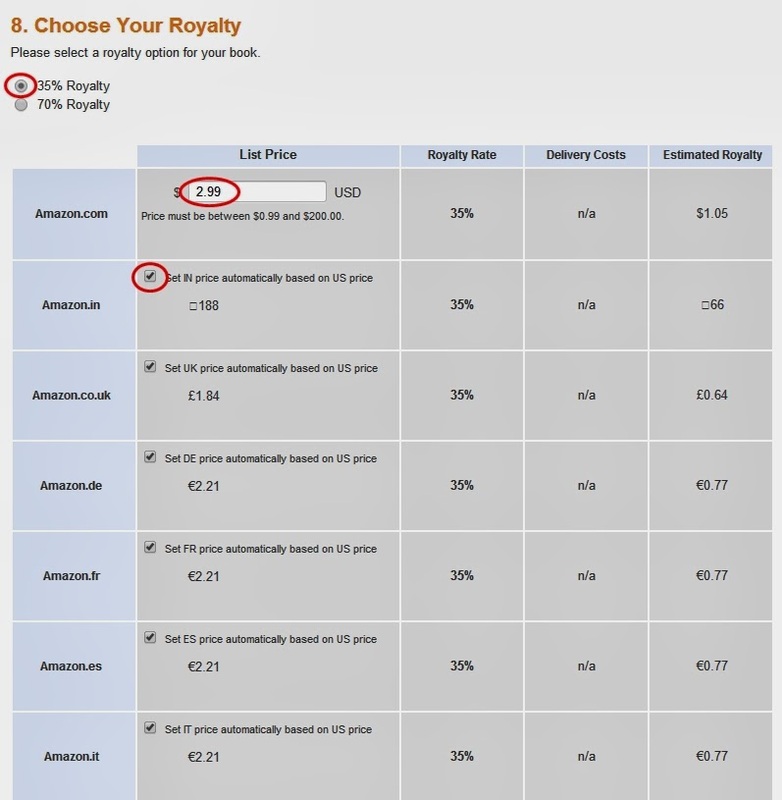 Next you want to choose your royalty percentage. 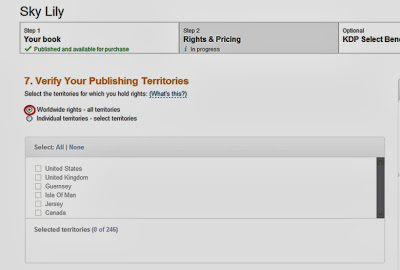 Now choosing a 35% royalty will mean that you earn 35% of the sale price when your book is purchased in any territory. Choosing a 70% royalty however has a few variations, first of all 70% does not apply to all territories, in which case several of the territories will be set to 35%, also if you select 70% there will be a small delivery cost, determined by the number of megabytes, which will be subtracted from your earnings. 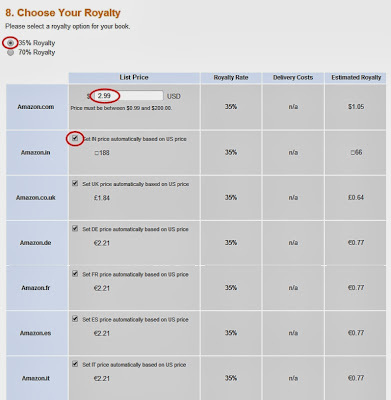 After you have selected your royalty you can set your price, note that your price is automatically set to USD. 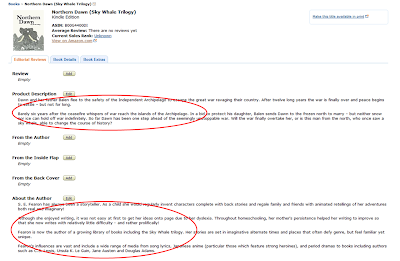 For a new and unknown author 2.99 USD is a reasonable price and it is a price which has proven to sell well. After you enter your price you will notice that the following Amazon sites will select set price automatically based on USD price. 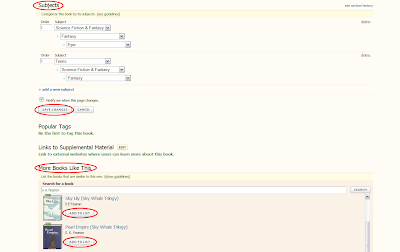 You can leave this as is or if you wish you can deselect it and set a custom price for as many sites as you like. 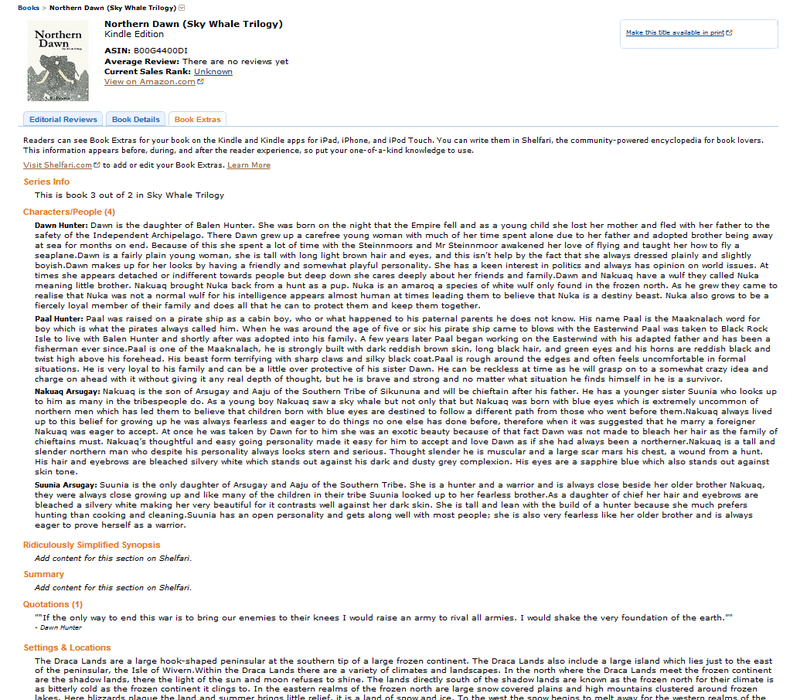 Next you want to take a look at the Kindle MatchBook and the Kindle Book Lending programs. 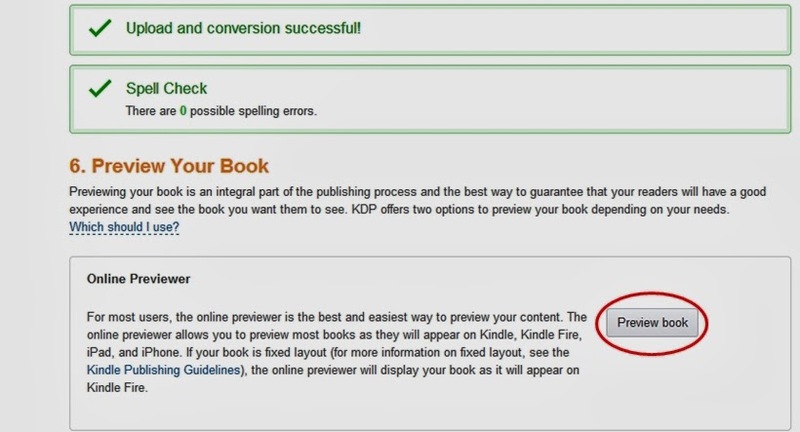 Kindle MatchBook enables readers who have purchased a paperback of your book to purchase the eBook at a 50% discount, and Kindle Book Lending allows readers to lend a copy of your book to a person of their choice for 14 days. After you have selected which programs you want that’s it now you can click save and publish. 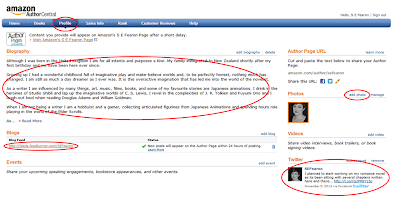 Now that you have published your book I suggest that you head over to Amazon Author Central to setup an Author Page and you can use your existing Amazon account to register. Once you have signed in you will find yourself in the home section of your account. First you want to click profile, in this section you can add a biography, link your blog feed, upload a profile photo, and link your twitter account. 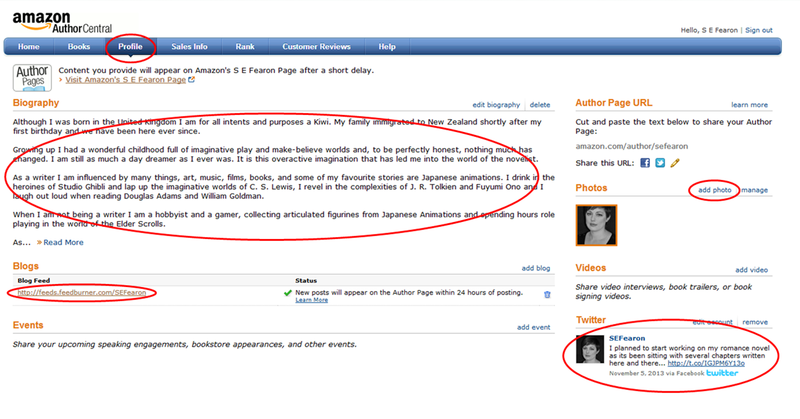 It also provides you with a URL link to your Author Page and the option of sharing it on Facebook and Twitter. 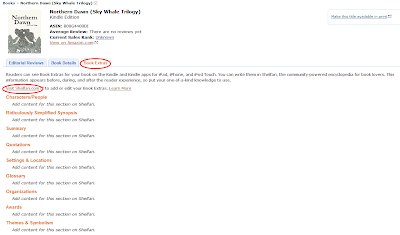 Once satisfied you can click on books, in this section you can link your book to your Author Page by simply click add more books, this will open a popup where you can search for your book in order to link it. 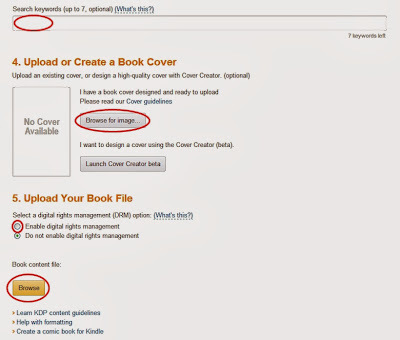 After you have added your book you should click on the title which will take you to a new page where you can add supplementary information. 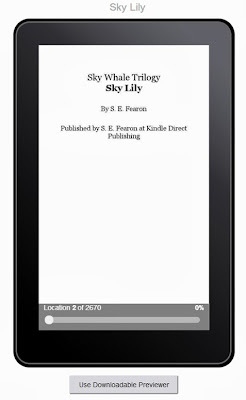 To begin with put your synopsis under product description and under about the author you can enter your biography. You may also wish to include a personal introduction to your book under the heading from the author. 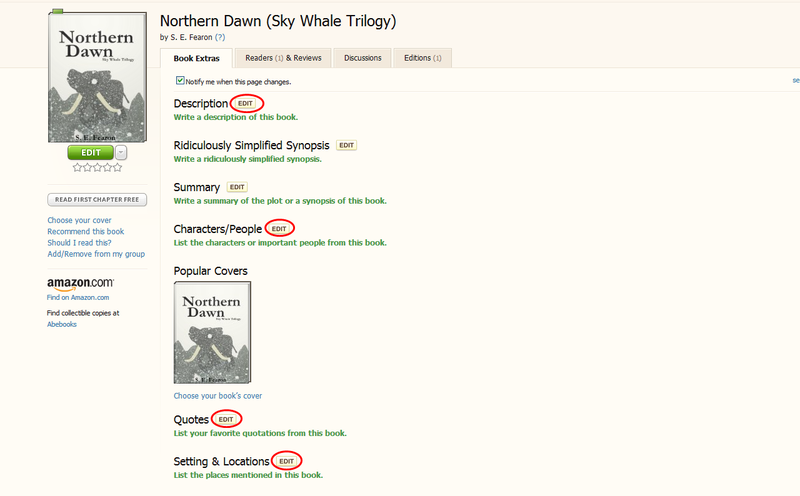 You can add even more supplementary information by clicking on book extras. You will notice that in this section in order to enter information you must work through Shelfari. 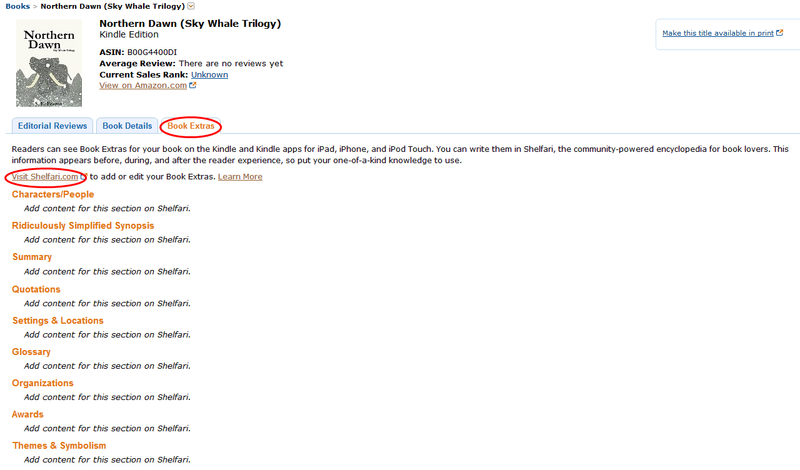 To get started click the link visit Shelfari.com and once there you can register using your Amazon account. 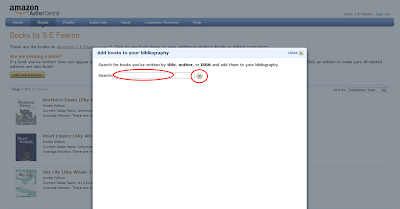 Once you have signed in you will want to search for your book and once found you will be able to edit several sections relating to your book. Under description you should place your synopsis then, if you wish, you can add character profiles, quotes from your book, information on the setting and location, the first sentence of your book, the table of contents, a glossary, and information on the themes and symbolism used in the book. 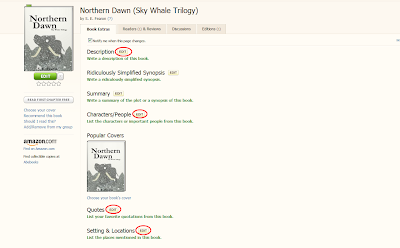 Next under series and lists you should link your book to its series, if applicable, and of course note down the volume number. 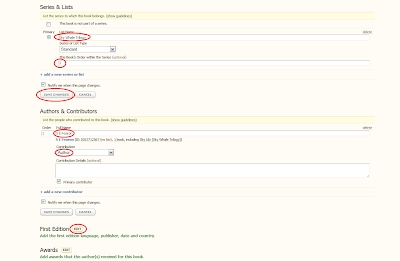 Then you want to list your authors and contributors. And if your book is an edition make sure to enter the relevant information. 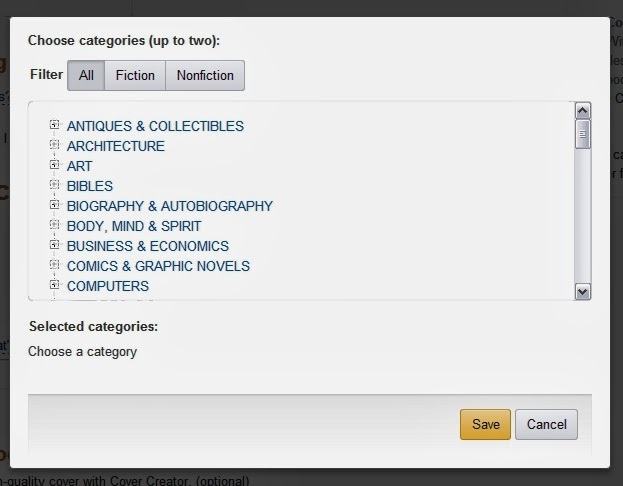 Then under subjects you want to select the categories you wish your book to appear under. Next you want to go to more books like this and search the authors name to locate your other books and when found click add to list. 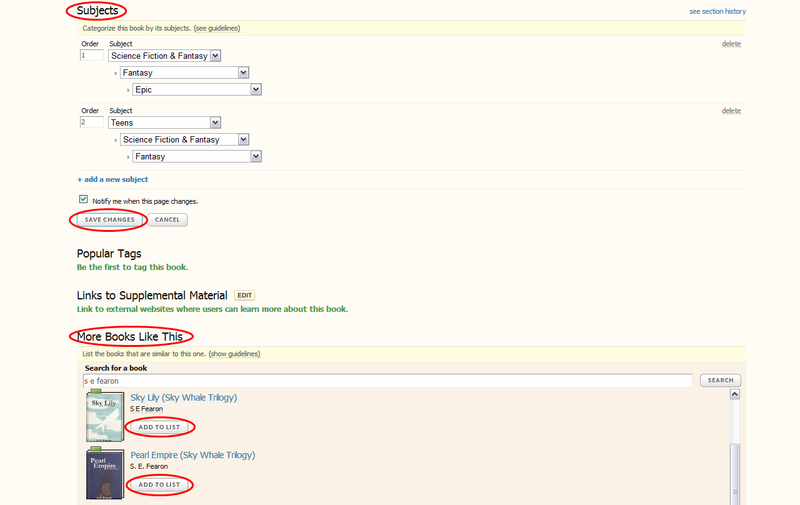 Once added it will ask you to write an explanation for the link, so if they are books in the same series state that or if they are works by the same author state that instead. 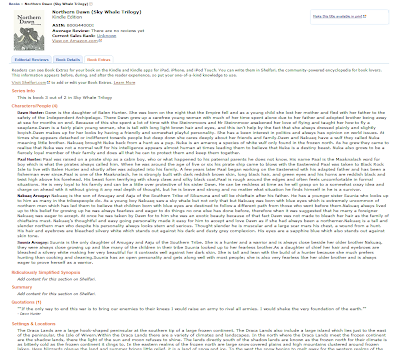 Now when you head back to Author Central you should see the supplementary information displayed. 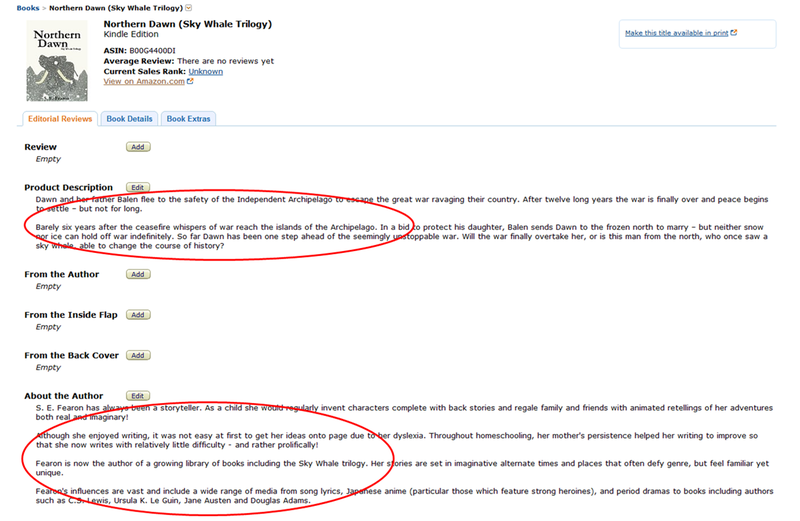 If you require more help publishing on Amazon you can find it here.